Ecuador’s President Lenin Moreno has terminated the credentials of his UK ambassador, who has been at the center of negotiating the fate of WikiLeaks co-founder Julian Assange, as concerns mount over the whistleblower's safety. The decree, with which Moreno effectively sacked Ecuador’s London ambassador Abad Ortiz, was published by WikiLeaks on Wednesday. The document does not offer any explanation as to why Ortiz, who had been his country’s ambassador to the UK since 2015, is now being permanently recalled. Nor does it name a successor for the outgoing diplomat. The decree is effective immediately. WikiLeaks tweeted that Abad, appointed to the office under President Rafael Correa, was the last diplomat the long-term self-exiled editor knew in the embassy. “All diplomats known to Assange have now been transferred away from the embassy,” the whistleblowing site claimed. Assange’s prolonged stay in Ecuador’s London embassy, where he has enjoyed protection from possible arrest and persecution in the US since 2012, has been hanging in the balance since the election of Moreno in 2017. Moreno, a former ally of Correa, has distanced himself from the anti-American policy of his predecessor and sought to reboot relations with the US. Ecuador is looking for US support in getting $3.9bn in international loans, and there have been reports that Washington's assistance would be conditional to Ecuador’s handling of the Assange case. There have also been reports of intense negotiations between senior UK and Ecuadorian officials over the prospects of Assange's eviction. The Times reported in summer that the talks were held at Foreign Office level. 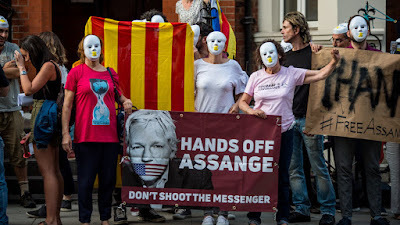 While Moreno has described Assange as “more than a nuisance” and “an inherited problem,” he repeatedly stated that Ecuador would not withdraw its protection unless the whistleblower breaches a set of stringent rules, which restrict his freedom of expression and visitation rights.